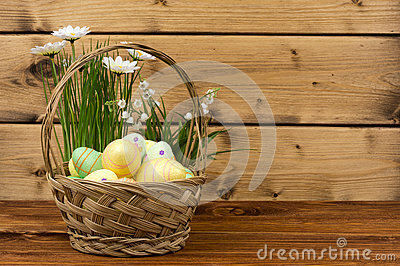 Easter decoration - basket with eggs, flowers on brown wooden background. Easter decor in pastel colors. Easter eggs, candy, sweets, flowers and eggshells. Colorful painted Easter eggs lie in a basket with flowers, on a wooden background, with a fluffy Easter bunny.